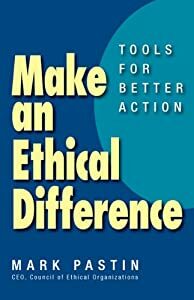 Make an Ethical Difference has been getting a lot of PR which of course is all to the good except that it makes it hard to keep this page up to date. One of the topics that focuses the book is why people disagree so much about ethics – and whether it matters. People just have a hard time changing their minds when it comes to ethics. An article on this topic appeared at Yahoo News. I was asked to write something on why truth telling matters, especially for CEOs, for CEO magazine. I always appreciate comments on these pieces, none of which is repetitious of the book, at my personal email address councile@aol.com.